Sue is a long-standing, albeit high-strung, customer of Papa’s many restaurants. 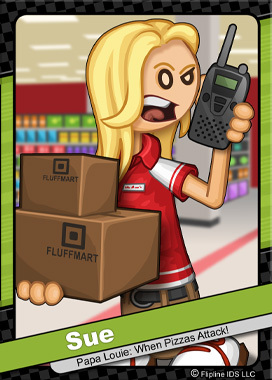 She is a hard working team leader at the Tastyville Fluffmart. On a normal workday, Sue can be seen pacing the sales floor while frantically barking orders to her underlings. Unfortunately, for all the diligent work that she accomplishes, Sue rarely receives any praise from upper management, which only adds to her irritability.